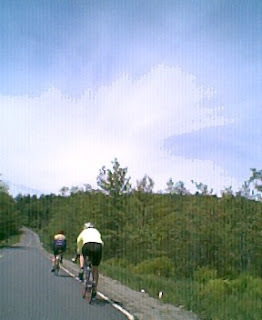 Memorial Day weekend started out cool and dry - splendid conditions for the KVBC ride around the Belgrade Lakes. The ride was a challenging one, although there were some long stretches of fairly flat terrain with little traffic, particularly through North Belgrade. Somewhere along the road is situated the local weather reporting station that relays data to this blog, but we couldn't discern where exactly it was. No matter - we didn't need to check out the weather chart to see if it was safe to go outside. We just had to decide on "how many layers" to start out with. The route turned much more challenging as we turned west. 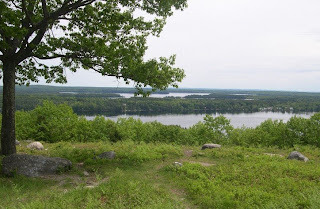 One thing about the hills in the Kennebec Highlands though, they do present some spectacular vistas. Here: the Blueberry Hill Scenic Overlook. All roads lead to Rome, so the odometers should all agree, shouldn't they? 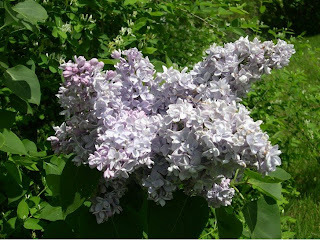 The route seemed to be flanked everywhere with a striking abundance and variety of Lilacs and more Lilacs. The fragrance followed us everywhere. 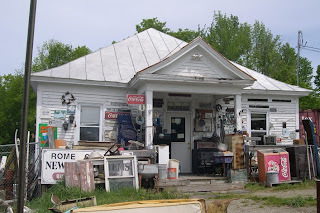 Aside from natural wonders, there were more prosaic sights, such as the Rome Corner Trading Post. 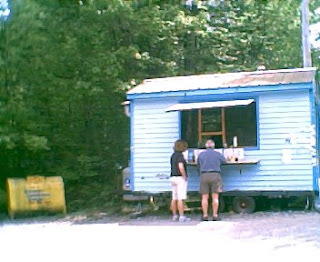 And for culinary pleasures, there was Fast Fred's Franks, where belying its name (and the challenge of repeating it three times), the ambiance is decidedly relaxed. Who knows what sights we'll see on the next KVBC ride?